Vic is a paraplegic; he was injured in a mountain Biking accident almost 18 years ago in Forest Park, Queens. We became friendly about 2 years after his injury. When you speak to Vic for about 2 minutes you forget that he is in a wheelchair and you think of him as someone who can do anything that you or I could do. And he does. We have two young daughters, 9 and 6, and they think their Dad can do or fix anything. He is a disabled athlete who competed in the Winter Paralympics games in Nagano, Japan in 1998 and who has stayed involved in the sport of sled hockey since. 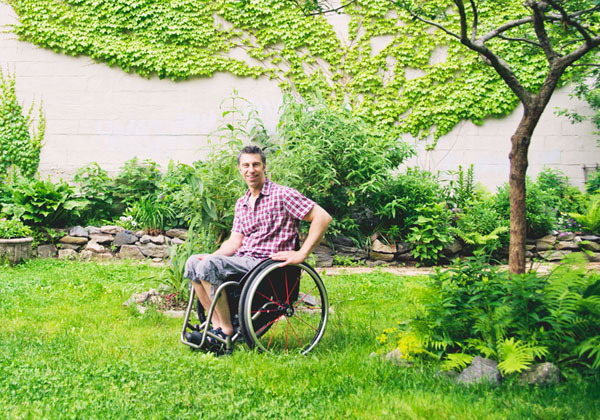 He works for NYC parks as the ADA coordinator to make all parks accessible to people with disabilities. He also organizes events throughout the 5 boros for kids with disabilities. He is frequently asked to speak at different events and organizations around the city. He is also about to complete his Masters degree all while being totally involved in our daughters activities (soccer coach) and working full time. And he has a great personality, most everyone who meets him is drawn to him in some way.